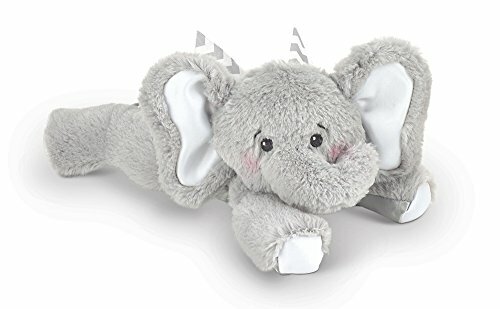 Bearington Baby Spout Plush Stuffed Animal Elephant Rattle, 8"
This soft, plush, baby elephant rattle provides comfort to babies and play activity for babies. This baby rattle is sure to become baby's favorite. Measuring 8", this rattle is the perfect size for baby to hold and cuddle. Made by the Bearington Baby Collection, known for their outstanding quality and fine fabrics. Gives you the assurance that this will be one that is treasured for years. 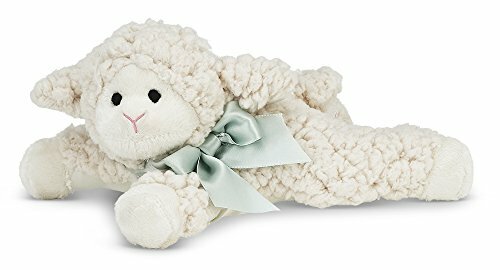 Baby GUND Winky Lamb Stuffed Animal Plush Rattle, White, 4.5"
GUND is proud to introduce Winky — a precious little white lamb that’s even softer than she looks! This rattle format makes fun shaking noises as baby plays for added interactive value and sensory input. Winky is also available in a variety of other formats, including plush toys, Huggybuddies, music toys, and more. Your child’s safety is our top concern, so all babyGUND products feature embroidered eye and nose details. Machine-washable. All ages. About GUND: For more than 100 years, GUND has been a premier plush company recognized worldwide for quality innovative products. Building upon our award-winning and beloved plush designs, we continue to practice innovation by constantly developing new original and licensed designs to appeal to the next generation of customers. To that end, each one of our plush toys is constructed from premium materials for unparalleled softness and huggability. GUND is proud to introduce Tucker — an adorable little giraffe that’s looking for a new pal! Huggybuddy plush toys bridge the gap between baby’s favorite blanket, and baby’s favorite stuffed animal. Made from soft, huggable plush, each Huggybuddy features a delicate satin underside that feels smooth and cool against baby’s skin for added tactile sensation. 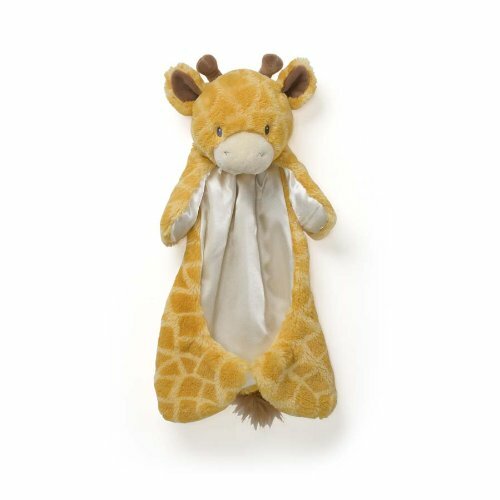 Tucker features a realistic giraffe fur pattern that’s a fashion-forward addition to any nursery or playroom — perfect for boys and girls alike. Your child’s safety is our top concern, so all babyGUND products feature embroidered eye and nose details. Machine-washable. All ages. About GUND: For more than 100 years, GUND has been a premier plush company recognized worldwide for quality innovative products. Building upon our award-winning and beloved plush designs, we continue to practice innovation by constantly developing new original and licensed designs to appeal to the next generation of customers. To that end, each one of our plush toys is constructed from premium materials for unparalleled softness and huggability. 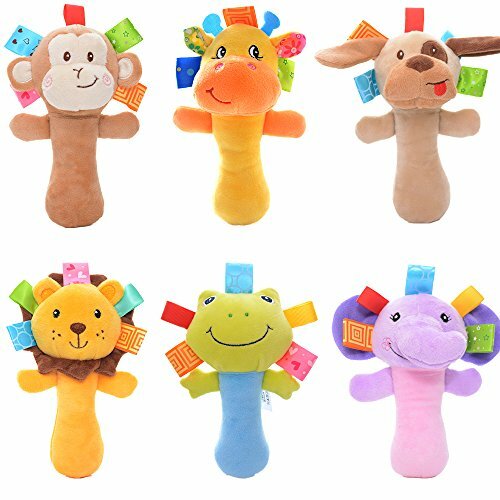 Baby Cartoon Stuffed Animal Plush Hand Rattle Sticker Toys Dolls Made of high quality environmentally friendly plush fabric+ pp cotton filler. Package included 2 pcs random styles rattle toys. Appox weight: 80 g per rattle toy. Training your baby's finger grip ability and empowerment the power of wrist. Specially designed for baby and easy to grasp. Funny and attractive for parent-children games. Best gifts for your baby birthday gifts. 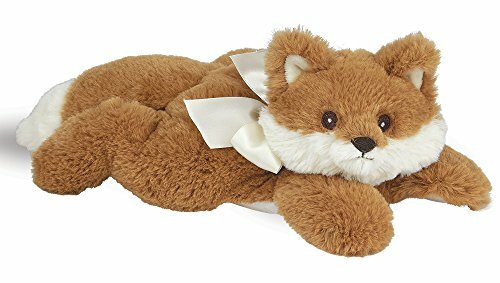 Bearington Baby Fritz, Stuffed Animal Fox Rattle 8"
This soft plush baby fox rattle provides comfort to babies and play activity for babies. This baby rattle is sure to become baby's favorite. Measuring 8", this rattle is the perfect size for baby to hold and cuddle. Bearington Baby Collection, know worldwide for its outstanding quality and award winning designs,gives you the assurance that this baby item will be one that is treasured for years. Approved for ages 0 and up. Surface washable. Great minds start little.™ Soft, friendly and happy, the Octoplush is a wonderful companion for little ones to explore color. 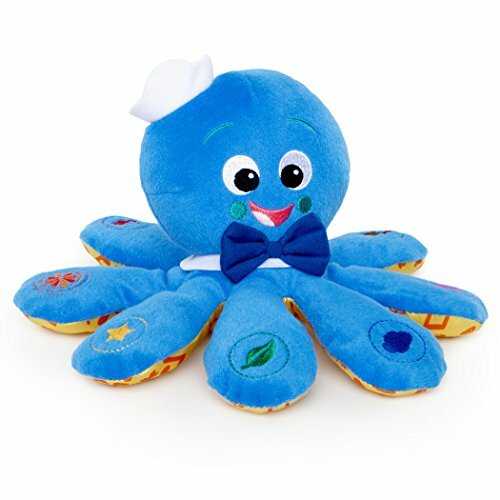 Each of Octoplush's soft legs features a colorful embroidered image. Squeeze each leg to hear a color corresponding to the color of the embroidered object in English, Spanish or French. Colors include: red, orange, yellow, green, blue, purple, white and brown. Each color is followed by a short classical melody. Squeeze Octoplush's head to activate additional classical melodies! Baby can discover a world of colors, music and fun with Octoplush! 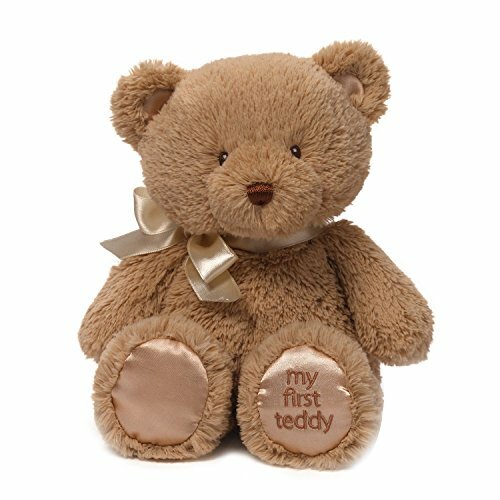 Baby GUND My First Teddy Bear Stuffed Animal Plush in Brown, 10"
GUND knows that it's never too early to make a lifelong friend. My First Teddy is a soft and huggable 10 inch companion that's always ready for naptime, playtime, and any time in between. Designed with delicate satin accents on teddy's feet, ears, and decorative bow. This on-trend tan color is a unique alternative to the traditional pink or blue - perfect for baby girls and boys alike. Your child's safety is our top concern, so all babyGUND products feature embroidered eye and nose details. Coordinates with matching ring rattles, sound toys, and more for a great newborn or baby shower gift idea. Machine-washable. All ages. About GUND: For more than 100 years, GUND has been a premier plush company recognized worldwide for quality innovative products. Building upon our award-winning and beloved plush designs, we continue to practice innovation by constantly developing new original and licensed designs to appeal to the next generation of customers. To that end, each one of our plush toys is constructed from premium materials for unparalleled softness and huggability. Bearington Baby Baa Plush Stuffed Animal Lamb Rattle 8"
This soft plush, stuffed animal lamb baby rattle provides comfort to babies and play activity for babies. This soft baby rattle is sure to become baby's favorite. Measuring 8", this rattle is the perfect size for baby to hold and cuddle. Made by the Bearington Baby known for their outstanding quality and fine fabrics. Gives you the assurance that this will be one that is treasured for years. Simply press the belly of this adorable, eight inch white lamb to hear it say, "Baa, baa, baa". 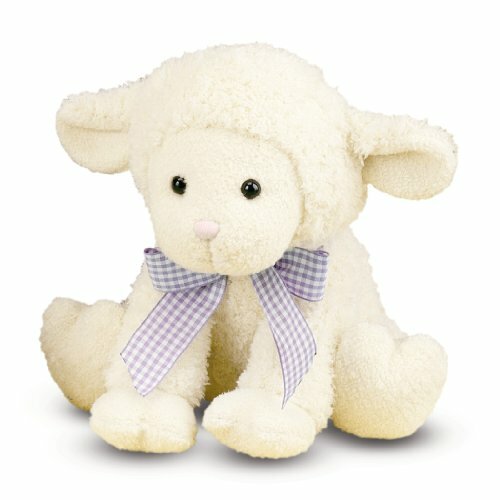 Accessorized with a jaunty gingham bow, Lamby has soft, fuzzy "wool" and a smooth, kissable face. 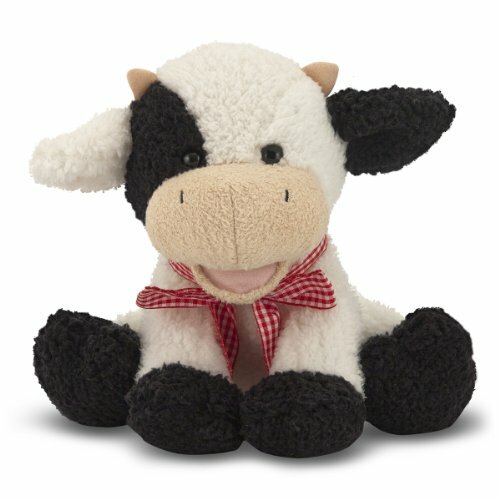 From its smiling face to its tufted tail, this eight inch calf is stuffed with personality. Gently squeeze its belly to make it moo. With a jaunty red gingham bow, this cuddly calf will win friends in the barnyard and beyond! 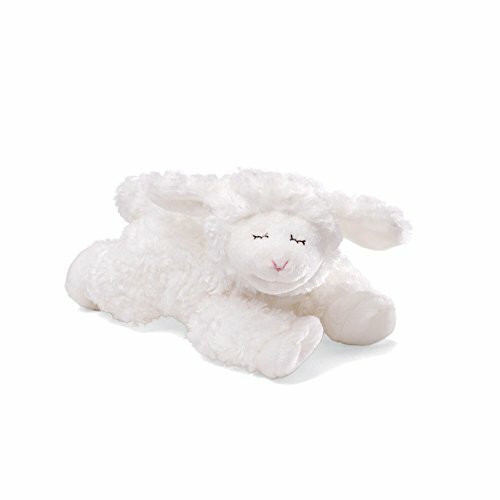 Compare prices on Infant Toys Stuffed Animals at ShoppinGent.com – use promo codes and coupons for best offers and deals. Start smart buying with ShoppinGent.com right now and choose your golden price on every purchase.